With the Command Mod, you will be able to give more advanced orders to your squad. In addition, there are many improvements to certain features of the game that make the atmosphere even more engaging and realistic. Soldiers are better at finding cover. Much more combat dialogue from US and German troops. There are about two dozen recorded phrases by each actor that were never implemented in the original games, until now. Grenades will be thrown more often and more accurately by AI soldiers, whom will also pick them up and throw them back at the enemy. Some soldiers will even dive on grenades to save their comrades. Some new animations, including command gestures and wounded soldiers limping. Even more stuff that I've currently forgotten about but is still awesome nonetheless. If you find that the new commands with the CommandMod mutator are too challenging to use or are a distraction, you should still use CommandModBasic mutator instead. CommandModBasic has all of the benefits listed above without the advanced commands. When you are using the Command Ring with the Command Mod, the ring will be shown on the object you're looking at, instead of the ground beneath it. This should make it easier to order your squad to faraway cover, when the ground isn't visible. Also, using the Switch Weapon key while holding the command ring (see below) will switch to a "move-only" alternate command mode, where the target ring will not appear even when the ring is on an enemy unit. This allows you to give a move order to an area that is near enemies, whereas the old command ring might only give you the option to just fire on them. And finally, the new ring fixes a problem that made it difficult to order your squad to target an enemy that you couldn't see when the suppression indicators were turned off. Now you can easily give targeting orders without leaving cover, even on Authentic. NOTE: Remember to press the "Use/Reload" key to cancel Waypoint Mode if the Command Ring won't go away after giving an order. You can peek over walls now by holding the Crouch key for a couple of seconds. You will have a third person view from just behind Baker's (or Red's) helmet. This allows you to survey the battlefield and give orders without having to get your head shot off. When a soldier from either side dives on a grenade to save his friends, you'll get to watch a quick cutscene of the heroic action. As described below, double-click the Fire while you are ordering and Assault to watch the assault from a new angle. Simply walk up to an obstacle or low wall, and while still pressing the Forward key to move into it, press the jump button to climb over or onto it. To throw a smoke grenade (if you have one), press and hold the Grenade key, and instead of a frag grenade, you will throw a smoke grenade instead. See the Smoke Grenade section for more information. Order your men to follow waypoints, pick up enemy Panzerfausts, man German MGs, maneuver silently under cover, widen their formation, assault tanks, and throw grenades (frag and smoke). It's up to you to determine when to use these to maximize your strategic advantages. NOTE: Please read the section below about Waypoints if the Command Ring won't disappear after giving orders. Your Assault Team now has the capability to Assault Tanks. They must have a strategic advantage or they will refuse the order (usually in a humorous way). At minimum, you need two soldiers still alive with at least one grenade, and either the tank must already be seriously damaged or the team must have a Panzerfaust. If the assault fails, the team will attempt to flee to their previous location. Squad will move a little beyond the ordered location and widen their formation. Use this to move your squad to an area that you can't see because of some obstruction, or to occupy a building. A squad member will throw a grenade at the area or target. Toggles a move-only Command Ring that will not target enemies. Team will return to its last location. Squad will spread out, looking for cover in a larger area. Cancel all queued waypoint orders, dismount any machine guns, halt, tighten formation, and find cover. The new orders simply use new combinations of keys and the command ring. For example, just like the Assault order where you hold the command ring over a target and press Fire, the Grenade order has you holding the command ring over a target and pressing the Grenade key. Man the MG: give a move order to a machine gun's location. You should see a special "cannon" icon above the Command Ring. Pick Up Panzerfaust/Bazooka: give a move order to a dropped Panzerfaust or Ammo Box. You should see a "Panzerfaust" icon above the Command Ring. Ordering waypoints gives you the ability to maneuver your squad around large areas while staying behind cover. You can queue up and combine almost any type of order. 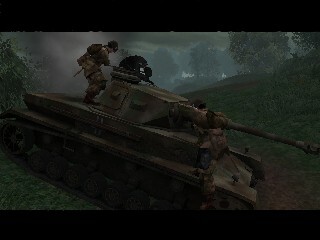 For example you could order your team to Pick Up Panzerfaust, then Maneuver Under Cover to a new location, and then Assault the enemy from the new position. Waypoint Mode is activated by tapping the Command button quickly, instead of holding it for a bit and releasing it as you would with a normal move order. When you are in Waypoint Mode, the Command Ring will stay onscreen, and any orders you give in this mode will be queued up after the current orders list. Press and hold the Command button. The order you give while holding the Command button will be the last in the queue. Press the Use key. Current waypoints for the squad will still be carried out. Press the Fall Out key. All waypoints will be cancelled. If you really can't stand Waypoint mode, and it keeps activating unintentionally, you can disable it permanently by editing your User.ini file. See the ReadMe for instructions on how to do this.